Richard Fred Heck (August 15, 1931 – October 10, 2015) was an American chemist. He was known for the discovery and development of the Heck reaction, which uses palladium to catalyze organic chemical reactions that couple aryl halides with alkenes. Heck was awarded the Nobel Prize in Chemistry on October 6, 2010, with the Japanese chemists Ei-ichi Negishi and Akira Suzuki, for their work in palladium-catalyzed coupling reactions in organic synthesis. Heck died on October 10, 2015 in Manila in hospital, aged 84. He suffered a bout of severe vomiting earlier in the week. ↑ Suarez, Larissa Mae. "US scientist residing in Philippines wins 2010 chemistry Nobel". GMANews.tv. ↑ Quismundo, Tarra. "He's the only Nobel winner living in RP". Inquirer.net. ↑ Francisco, Rosemarie (2015-10-10). 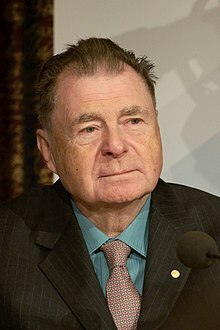 "Nobel laureate chemist Richard Heck, 84, dies in Manila". Reuters. Retrieved 2015-10-10. This page was last changed on 12 January 2016, at 03:07.